Through lobbying, media, and public statements, the left-wing Center for American Progress (CAP) routinely used its influence to push for legislation that benefitted its major corporate donors, a Washington Free Beacon analysis has found. The confluence of CAP’s work and the financial and political interests of its major financial supporters could undermine the group’s insistence that it is "fiercely and proudly independent," as CAP vice president of communications Andrea Purse recently claimed. Purse offered that assessment while criticizing a recent article in the Nation that revealed details of CAP’s Business Alliance fundraising program. The effort offered corporations and their executives access to CAP staffers and public officials in exchange for five- and six-figure contributions. "The inference at the heart of the author’s story is that corporate donations shape or drive the content of CAP and [the Center for American Progress Action Fund]," Purse wrote. "That assertion is baseless and completely false." However, publicly available information shows that the liberal think tank and its "Action" activist arm frequently worked to advance the interests of high-profile Business Alliance donors. In numerous instances, CAP and its corporate donors lobbied Congress on the same pieces of legislation. One CAP senior fellow was also employed as a lobbyist for defense contractor and Business Alliance donor Lockheed Martin: Ralph Scott Lilly was paid $221,000 for lobbying work on Lockheed’s behalf while employed by CAP. Lilly frequently lobbied Congress on Lockheed’s behalf on the issue of "Foreign Military Sales"—listed on at least 18 of Lilly’s disclosure filings. Lockheed is a major foreign military sales contractor. Meanwhile, ThinkProgress, the blog of CAP’s Action Fund, advocated increased use of the Foreign Military Sales program as a means to stabilize the Gulf region following the U.S. troop withdrawal from Iraq. Disclosure forms show that CAP and Lockheed both lobbied Congress on 18 of the same pieces of legislation throughout 2010 and 2011. ThinkProgress has also covered Lockheed positively, praising its support for "green energy" and its treatment of gay and lesbian employees. CAP has praised Lockheed’s support for the U.N. Convention on the Law of the Sea. Lockheed declined to comment on its relationship with the Center for American Progress. The only Business Alliance donor that returned requests for comment was General Electric (GE). GE spokesman Sebastien Duchamp told the Free Beacon that it has "not worked directly with [CAP] on any specific pieces of legislation but rather around big issues such as skills, advanced manufacturing and energy issues." ThinkProgress wrote in 2012 that GE is one of a handful of companies that "have shown that integrating sustainability can be good for a business’s bottom line." However, much of GE’s green energy profitability has come by way of federal market interventions often praised and supported by CAP. CAP lobbyist Jack Swetland reported lobbying Congress in 2011 on the Better Use of Light Bulbs Act. The legislation is expected to benefit GE by effectively banning the use of incandescent light bulbs, and giving compact fluorescent bulbs, which GE manufactures, a larger market share. CAP also lobbied for cap and trade legislation in 2009. While ThinkProgress and CAP proper frequently lauded the legislation. ThinkProgress was also outspoken in opposition to a carbon tax as an alternative to a cap and trade scheme. GE would have benefitted tremendously from a greenhouse gas credit trading system, which the 2009 cap and trade bill would have established, due to its Greenhouse Gas Services venture. That business was set up to create and trade the greenhouse gas credits that the bill would have made mandatory for all carbon-emitting industries. Because a carbon tax does not require the trading of those credits, such a proposal, which ThinkProgress derided as "woefully inadequate and incomplete," would not have as financially beneficial for the company. ThinkProgress has also vehemently fought efforts to reduce funding for the Export-Import Bank, which finances purchases of U.S. exports. GE has been a top beneficiary of Ex-Im loans and loan guarantees. That is not the only Ex-Im tie to the Business Alliance. Business Alliance donor Boeing reportedly accounts for more than 80 percent of Ex-Im financing. First Solar, a Business Alliance donor that a CAP executive praised in congressional testimony last year, has also benefitted from Ex-Im loans. ThinkProgress has extolled the benefits of the bank without disclosing its donors’ financial stakes in its continued operation. The CAP Action Fund blog has accused Republicans of "trying to strangle U.S. exports" for their attempts to reduce funding for the bank. ThinkProgress suggested that House Majority Leader Eric Cantor (R., Va.) opposed reauthorization to satisfy campaign donors despite its own donors benefitting from the continued operation of the bank. President Barack Obama, who in 2008 called the Ex-Im bank "little more than a fund for corporate welfare," signed a measure reauthorizing the bank in May 2012. Ex-Im announced in December that CAP president Neera Tanden would speak at its next annual conference. The previous year’s reauthorization came after Boeing paid at least $200,000 to the Podesta Group—the lobbying firm co-founded by CAP chairman John Podesta and run by his brother Tony—to push for its passage. As Obama’s transition team chief, John Podesta was involved in crafting the 2009 stimulus bill. Business Alliance donor Pacific Gas and Electric (PG&E) would eventually receive nearly $50 million in grants and contracts through the stimulus. Green energy companies that received a combined $5.5 billion in taxpayer-backed loans planned to sell power to PG&E. According to the Energy Department, the company is the sole power purchaser for a number of taxpayer-financed green energy producers. First Solar reached a deal to sell power to PG&E in 2012. PG&E’s large stake in green energy gives it a financial incentive to support strict emissions reduction measures, which affect competitors that buy power from coal energy producers. The CAP-supported cap and trade bill also would have had a smaller impact on PG&E than its competitors. CAP’s persistent lobbying for and public statements in support of such measures therefore served PG&E’s bottom line. "We are well-positioned vis-à-vis the carbon question," explained former PG&E CEO Peter Darbee after the company announced it would leave the U.S. Chamber of Commerce due to its opposition to cap and trade legislation. CAP would later attack the Chamber with unproven accusations that it was funneling foreign money into U.S. elections. 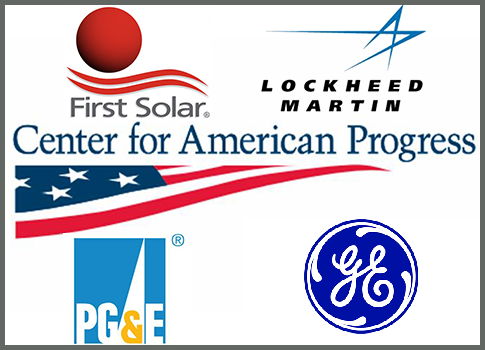 PG&E and CAP both lobbied for a 2009 measure that would require strict emissions reductions for power plants, subsidies for investment in and production of wind energy, incentives for energy efficient housing retrofits, and efforts to adopt more strict environmental building codes, in addition to a dozen other pieces of legislation. The Center for American Progress routinely failed to disclose the conflicts of interest mentioned in this story. CAP did not respond to a request for comment on this story. This entry was posted in Politics and tagged Center for American Progress, Cronyism, Democratic Donors, Ex-Im Bank, First Solar, General Electric, Lockheed Martin, Natural Gas, Progressive Movement, ThinkProgress. Bookmark the permalink.